What It’s About: A serial killer who preys on those he deems “weak”-those with disabilities or disfigurements. Helen Chapel (Dorothy McGuire) is a maid who works for a rich family in a large old house. She is unable to talk due to the psychological trauma of seeing her parents die in a fire, and thus an obvious next target for the killer. When a massive storm strands Helen and her employers in their home, can Helen overcome her trauma and and will she survive? Why Watch it Today? : The American Disabilities Act was signed today in 1990. 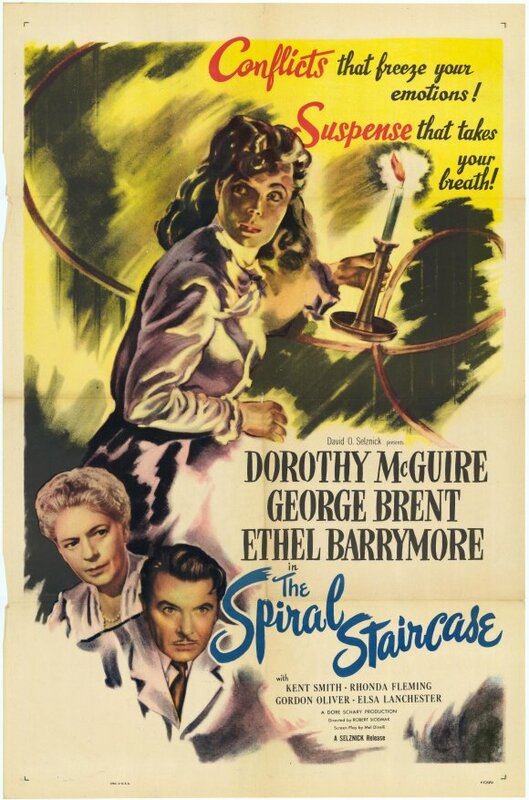 The Spiral Staircase is a solid entry in the 1940s sub-genre of thrillers with a strong dramatic bent focusing on women in trouble (other examples include Gaslight and Sorry, Wrong Number). This entry was posted in Adaptation, Based on a Book, Black and White, Movie of the Day, Mystery, Period Film, Serial Killer, Thriller, Whodunnit and tagged alcoholic, Best Supporting Actress Nominee, day dreaming, doctor, dream, Elsa Lanchester, Ethel Barrymore, fantasy sequence, George Brent, insanity, Kent Smith, maid, movie theater, mutes, post traumatic stress disorder, Rhys Williams, RKO, Robert Siodmak, serial killer, storm, turn of the century, willpower can solve anything.